Not just atheists, actually. Friendship with all ‘unbelievers’ was off the table. 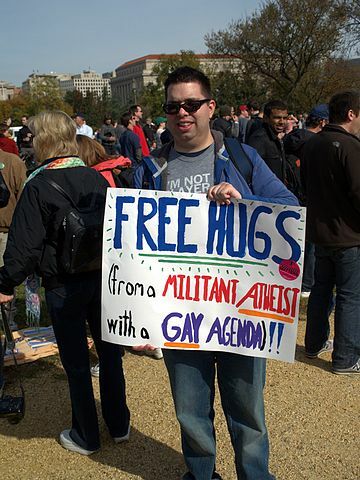 Once again I am a guest poster at The Friendly Atheist. The social division caused by this kind of education is a much more immediate harm than the threat of creationism, but it’s received less attention. I want to put that right. Please check out my post and share it if you like it. When I stopped being a Christian, I was not happy about it. There are a great many Christian tropes about atheists: they’re just too proud to submit to God; they’re just angry at God; they’re just too selfish to stop sinning; they hate God. None of those were true of me at the time. My heart was not “hardened against God”. I really wanted to believe. I just couldn’t. That’s not the case anymore. I like the universe without God in it a lot more than I liked it when I thought there was an Almighty watching over it. I don’t think there is a God (or gods, or godesses), and I’m glad about that. The idea of worship now seems servile and unpleasant to me. But I’m happy for those who want to engage in it to do so.